Data transformation is FME's ability to manipulate data during format translation. The key feature of this ability is that transformation automatically takes place between the reading (extract) and writing (load) of data, without requiring user intervention. Transformation has the potential to produce output that is greater than the sum of the inputs. Data transformation can be subdivided into two distinct operations. This type of transformation refers to the ability of FME to channel data from source to destination in an almost infinite number of arrangements. This would include the ability to merge data, divide data, reorder data, and define custom data structures. Transforming the structure of a dataset is carried out by manipulation of its schema. This type of transformation refers to the ability to alter the content of a dataset; manipulation of a feature’s geometry or attribute values is the best example of how FME is able to transform content. Read more about Content Transformation. In FME Workbench, source and destination data are represented by objects in the workflow. In the same way, data manipulation is depicted by objects called Transformers. FME provides many different transformers to carry out different types of data operations. The list is segmented into descriptive category folders, but you can see the entire list by opening the All folder. All regular transformers are blue. You can also create Custom Transformers, which can be green or cyan, depending on whether they are embedded or linked. Some transformers have their own distinctive icon. Transformers that output new features have an icon on the left. 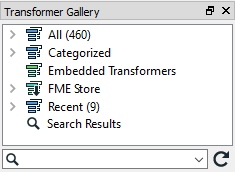 Transformers that consume data outside of the normal workspace flow have an icon on the right. You can create and store your own Custom Transformers. Workbench transformers are listed in the Transformer gallery.